Hotcig Centaur RTA Review - Daily Vaping Deals & The Best Vape Product Reviews at Vaping Cheap! 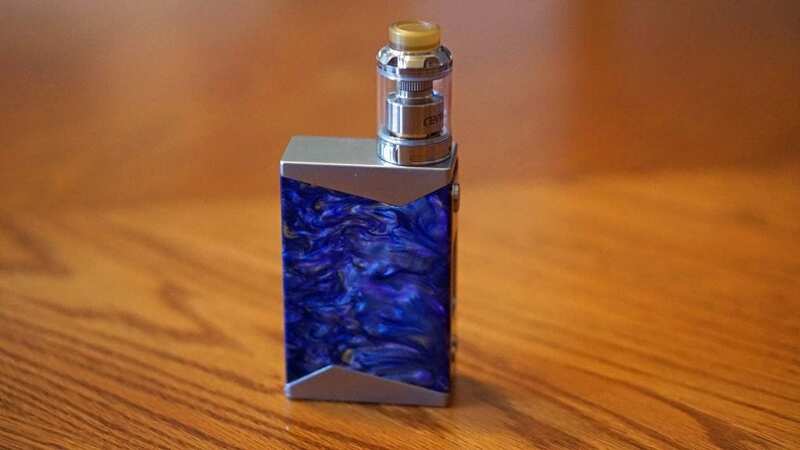 Hotcig is well known for releasing box mods, but when it comes to atomizers, there aren’t many that has been released by them. They’ve now stepped into the rebuildable tank atomizer market, and have recently released the Centaur RTA. Following the trend of many new RTAs of this year, it features a single coil build deck with airflow that hits not only the bottom of the coil, but the side as well giving you that “3D airflow” effect. Before getting any further we’d like to thank Efun Top for sending this atomizer our way for the purposes of this review. We’ll cover our first impressions, building and wicking, performance, pros and cons, and conclude with whether or not we recommend the Hotcig Centaur RTA! Click Here to Check Out the Centaur RTA by Hotcig! 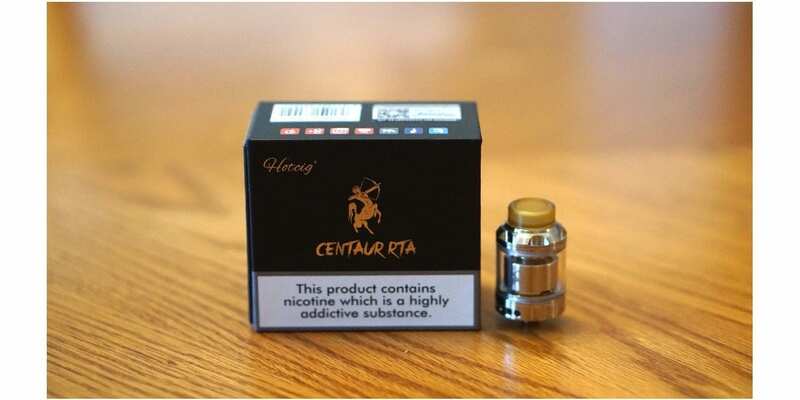 The Centaur RTA by Hotcig comes in a relatively simple box with the name of the atomizer right on the front alongside the logo and the nicotine warning, and on the back it has the same warning and information about what’s inside. On the side of the box there’s also a sticker which will indicate which color is inside, which in this case it’s the Silver color. There is also a Black color option available as well. Once you slide open the packaging, you’re immediately met with the Centaur RTA and the additional glass tank section. Underneath it, you will find the user manual, extension chimney, bag of Japanese cotton, and a bag of spare parts which also has a pre-built Clapton coil. The additional glass tank section is the larger variant which extends the e-liquid capacity to 4ml, and the pre-install variant only fits 2ml. This is definitely a pro in my opinion as it’s always a good thing to have options. I do wish an extra glass tank section was included whether another 2ml or 4ml. My first impressions of the Hotcig Centaur RTA is that it’s a good looking vape tank for sure. It does come with an wide bore Ultem 810 drip tip, but no 510 drip tip adapter, which may be a subjective con to some vapers. There are 5 small circular airflow holes on each side, and it is fully adjustable. The airflow does click into place, which is also something I do prefer with RTAs. With the 2ml glass tank section installed, it does have a rather short profile, so it’ll look great on some single battery mods for sure which is great if you’re into stealthy vape setups. However, do keep in mind it does have a 24mm base diameter, so mods that fit atomizers up to 22mm won’t suit this atomizer, but most newer vape mods will accommodate it just fine. I do want to mention that there were no signs of machine oil, which is a definite pro in my book! One wash with warm water, and this RTA was ready to be built! Overall, my first impressions of the Hotcig Centaur RTA were good with just some minor subjective cons to be mentioned. Building and wicking the Hotcig Centuar RTA is pretty straightforward and pretty easy as well. The Centaur RTA features a 2 post gold plated build deck which we’ve seen from some recent RTAs, so you would have to wrap your coil with the leads facing the opposite direction. You do have a good amount of space as well to fit some larger coil builds such as Fused Claptons, Aliens, and more. However, be sure that you clip the lead flush to the build deck. Failing to do so will end up with you having a short. The build deck is designed where you have one small airflow hole right under the coil and two larger side airflow holes that will hit both sides of your coil, giving you the “3D airflow system” we’ve seen in some past RTAs like the Geekvape Ammit 25 and Vandy Vape Govad RTA. This is definitely a good thing as from past experiences, this delivers excellent flavor. Wicking is easy thanks to its generously sized wicking channels. With these type of RTAs, you want to fill the entire wicking channel, but you want to make sure you’re not clogging it or stuffing too much cotton, which will end up with you having dry hits. Don’t put too little cotton either as that can end up with leaking. Simply fluff out your cotton and gently tuck it into the wicking channels. In addition, you want to make sure the cotton is just barely touching the bottom of the wicking channel. If you find you’re wicking is not right, you can work on the build deck while the tank is filled, which is definitely a pro. Overall, building and wicking the Hotcig Centaur RTA is relatively easy, and shouldn’t cause too much issues to the beginner or advanced user. 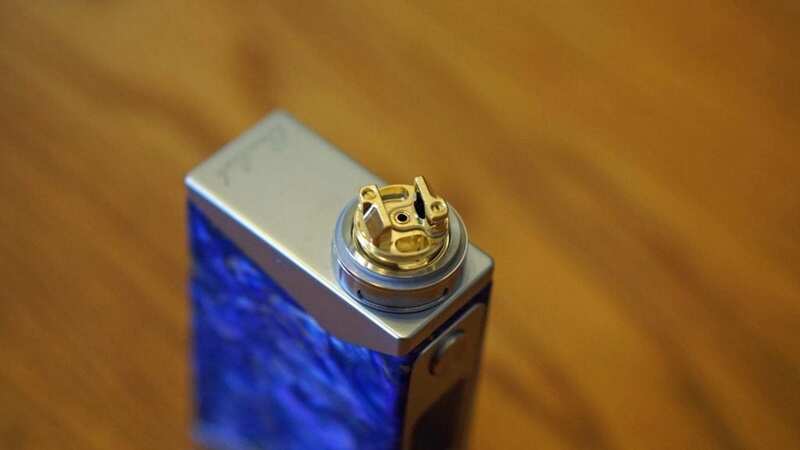 As mentioned previously, be sure to cut the excess leads flush to the build deck to avoid a short and don’t pack too much cotton into the wicking channels. Now the biggest question of this vape review is how well does the Hotcig Centaur perform? To answer that question, I’ll first go over my preferred coil build, which was a single Fused Clapton (26GA Ni80/36GA Ni80) which had a resistance of around 0.4 ohm. I found that this atomizer excels with a larger coil build, and I expected this since the deck itself is quite roomy and can accommodate rather large coil builds. With this specific coil build, I would vape it between 40w and 55w. Remember, since this is a single coil RTA, you don’t really need a lot of wattage to get a really good vape experience. At this wattage range, especially at the higher wattage range, I would get a nice warm flavorful vape. The flavor was definitely impressive and a bit better than what I initially expected. Since vaping at lower wattages, your battery life is also really good. I do want to mention that if I went higher than 55w, the wicking would struggle a bit to keep up while chain vaping or taking longer vapes. This could have been issues with my wicking specifically, but I’m pretty sure I wicked it quite well since 55w and below it would keep up with chain vaping with no issues. This can possibly be solved by using a bit less cotton, but I was satisfied with 55w and under, and didn’t feel the need to constantly turn up the wattage. The airflow is also very smooth, and there’s a surprising amount of airflow you have with the Centaur RTA. With the airflow wide open, there’s very little restriction, so I found myself cutting the airflow down to 4 or 3 holes open. With the airflow like this, it would add a bit more restriction to the draw, and this did help increase the flavor as well. The airflow is easily adjustable and you’ll have no issues adjusting it while this RTA atomizer is sitting on a mod. Like mentioned earlier, this tank has either a 2ml or 4ml e-liquid capacity. With the 2ml tank section installed, you’ll be filling this tank up quite frequently, so I found myself primarily using the 4ml tank section. This would last much longer as expected, and the flavor wasn’t noticeably different. Filling it is easy thanks to its top fill design which also sports large kidney shaped fill holes, so you can use pretty much any e-liquid bottle. Overall, the performance of the Hotcig Centaur RTA was excellent! The flavor was top notch and the vapor production was great as well. The only issue I found is chain vaping at higher wattages, and this could’ve been user error. In conclusion, the Hotcig Centaur RTA is a solid performing single coil RTA, and definitely impressive since it’s Hotcig’s first entry into the rebuildable tank atomizer market. 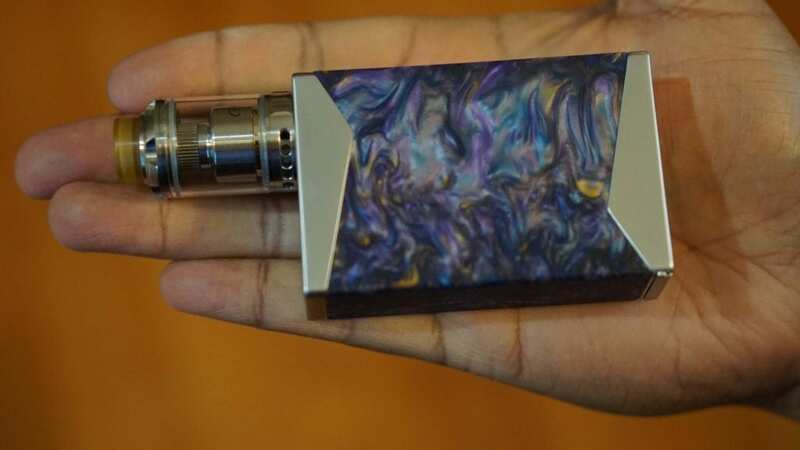 Like mentioned previously, this vape company is more known of their box mods, so it’s great to see them venturing into something different from what they’ve been doing for quite some time now. Just like pretty much every other atomizer reviewed, there were cons to be mentioned. Personally, it’s not a deal breaker if this RTA isn’t compatible with 510 drip tips since it does utilize 810 drip tips. The fact that you do have to make sure that your excess leads are cut flush to build deck is kind of expected as this is something that I aim for with all of my rebuildables, but it can be annoying to some vapers. Lastly, the fact that this RTA struggled at higher wattages could’ve been user error. Overall, the Hotcig Centaur RTA does perform well and would satisfy the needs of the vaper looking for a good single coil RTA that has great flavor and is easy to build and wick. Coming in at around $25 I think it’s a great deal and not a huge investment for those looking either to get into rebuilding or simply want to try a single coil RTA. I hope this review helps you with choosing the best atomizer to fit your vaping needs! If you have any questions or comments, feel free to leave them down below! Thanks for reading!